In the crowded and cobblestoned streets of Dumbo, NY there is a light shining out of Gleason’s Gym. This light is not from the boxing timer or the punch from a fighter but rather from the confidence and voices of people on the spectrum who attend the Spectrum Bout. The Spectrum Bout is a boxing therapy program that was designed for people on the autism spectrum in order to promote communication, socialization, fitness, and above all confidence. The program was designed by owner Jessica Margulies who has been working with students on the spectrum for over ten years both in the public school setting as well as the private. “Boxing has changed my life not only in reference to my fitness level, but my confidence has never been higher,” explained Jessica. “I wanted to create a program for those who are told they can’t and show them that they can.” The Spectrum Bout uses a tailored and data driven program in order to push students through a 45-minute workout that also fosters communication and confidence to a population that typically is under the baseline level in these areas. Students who attend the Spectrum Bout range in age from 4 to 21. The parents of this program are reporting that they not only see their students accomplishing things on a fitness level that they have never seen before but it is also transitioning into their everyday life. When Latonia* was asked about how her son has responded to the program she replied, “My son had an attempted bullying situation by a classmate in school last week. I say attempted because he handled himself so well and we are so proud of him. Jessica Margulies, owner of Bout Fitness and creator of the Spectrum Bout explains this program is more than an exercise program. It is a chance for students who are seen as not capable and unable to socialize with the world and fully immerse them in new situations and show them that they can and they will. She explains the hope is to build such a strong community of students in order to show them they are not alone as well as show the rest of the community that they are strong and develop a sense of acceptance for the autism population. “In order to sum up the program,” Jessica explains, “I came up with the slogan: I am told I can’t, I won’t, and I will never. 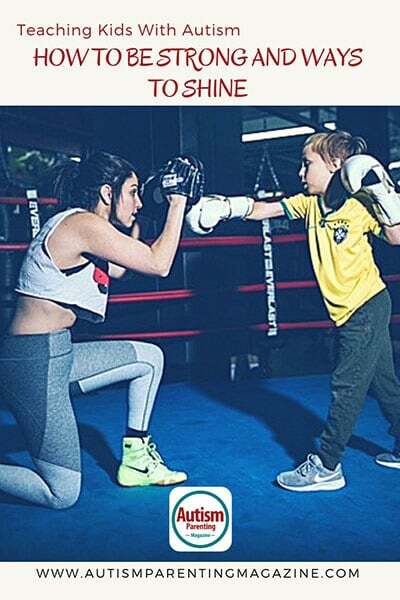 So I pick up my head and gloves and fight to show the world I can!” The Spectrum Bout is run every Sunday out of Gleason’s Gym in Brooklyn, NY and Jessica states she only hopes it grows and helps so many more. Jessica Margulies has been working with children on the spectrum for over ten years. She graduated from CW Post with a masters in childhood/special education. She then started at Developmental Disabilities Institute on Long Island working in early intervention. From there Jessica moved on to work at Manhattan Children’s Center for students with Autism. Jessica has a very strong behavioral and ABA background. She currently works for New York City DOE in a District 75 school in Queens. Her background has brought her to create the Spectrum Bout in order to help students on the spectrum learn and meet their needs through the sport of boxing. The Spectrum Bout was created with Jessica’s experience with students with Autism and data driven procedures to meet their unique needs.